Update 10/11/13: Auction Site for Legacy of the Land Through Art is up! Visit the site to view, bid on and/or purchase artwork from the exhibit! And here is Part II! 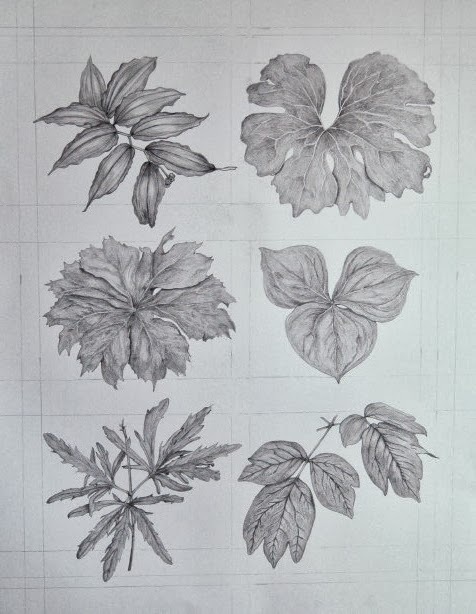 Wildflower Leaf Survey in graphite pencil. How did I end up deciding to do a piece like this? Why not another plant portrait? I am sure there are even more that I missed, but I was thrilled to realize that I encountered and was able to identify so many different species in my few outings. Using my reference photos, I did do a few sketches of different plants (see my post from May 28), and initially I thought I would like to do another plant portrait for my second piece. Although I was able to capture some beautiful mayapple blossoms, saw a couple of gorgeous nodding trillium (new to me) as well as pretty purple wild geranium with wonderful, fuzzy buds, I kept coming back to the idea of leaves. Doing a portrait of just one other plant seemed to shortchange the variety that are present in Creekshead Preserve. What if I wasn’t the only one who wanted to explore this area, but happened to miss the 1-2 week period when everything was in full bloom? 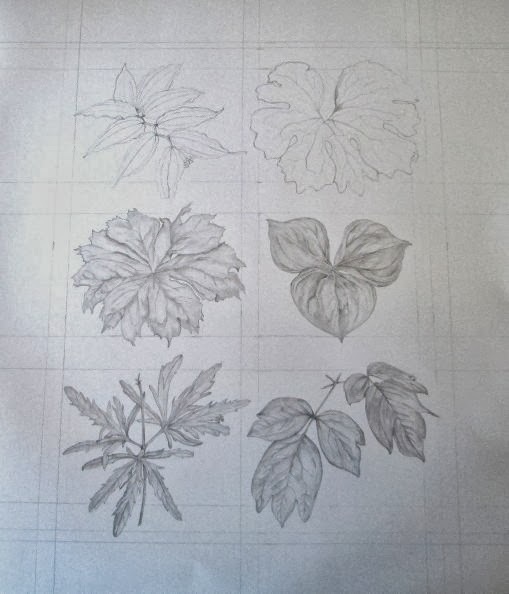 So, I decided that a survey of 4-6 leaves found in the preserve would best represent it for my second piece. As this exhibits focus is awareness of local land resources and conservation of those, educating an audience about what can be found there might be helpful. It looked OK, but I kept thinking I wanted to add more and include different-shaped leaves that I found intriguing, such as the False Solomon’s seal and cut-leaved toothwort. With the helpful advice of my husband (my go-to second set of eyes on these things! ), I decided to go with six different species and put them in a vertical format. I think this allowed for more visual interest and gave me more flexibility on where to place which leaves. For example, I love the way the False Solomon’s Seal leaves droop gracefully forward on the stem. Placing this in the upper left corner of the piece worked well compositionally, pointing the eye towards the rest of the leaves on the page. I spent a lot of time working out the composition and making sure my line drawings were accurate. I liked it so much that I decided to do the final piece entirely in graphite pencil. 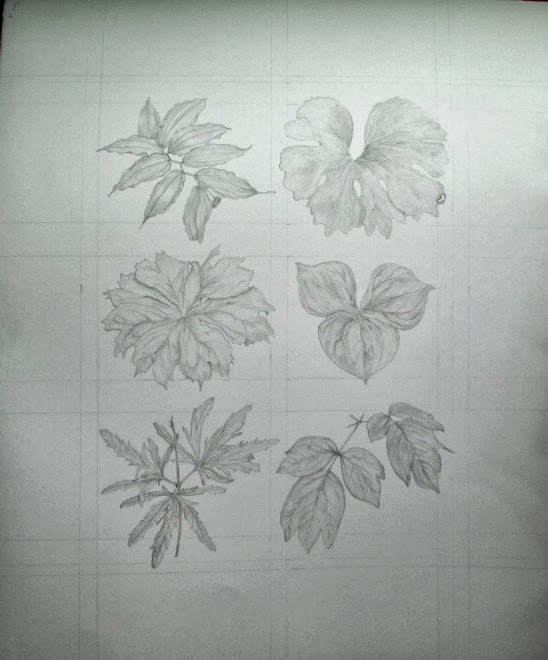 I wanted to eliminate any distractions and emphasize the shape and veining patterns on each of the leaves. I added a light grid around each leaf so that the leaves could slightly overlap it and pop out of the “frame” a bit, and it also allowed me to create space under each for a simple, printed label. 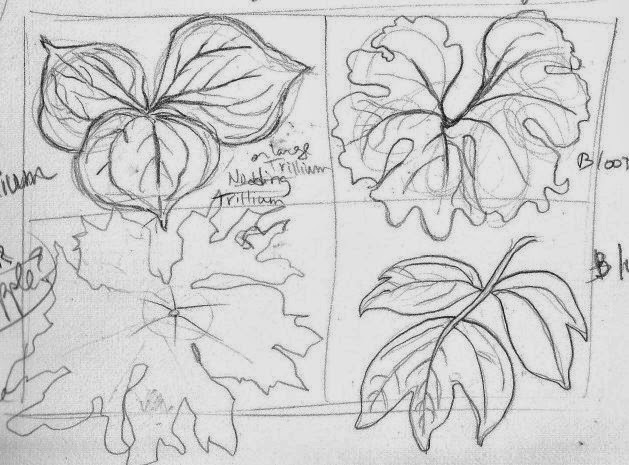 I started out with clear line drawings of the leaf perimeters as well as major veins, using my Faber-Castell 4H pencil. 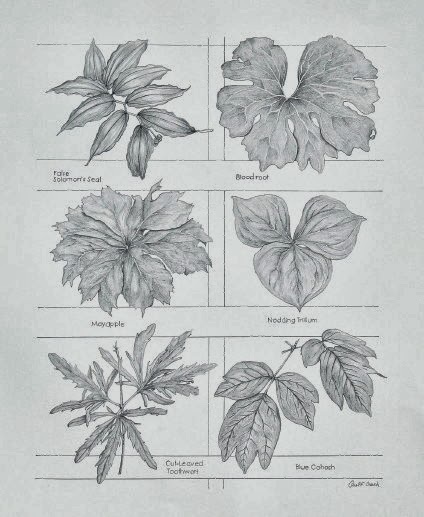 I ended up using a fine-tipped embossing tool to do much of the veining, especially on the bloodroot and trillium as the veins appear lighter than the surrounding leaf. I also did all of my initial shading with the 4H as it allowed me to map out the shading on each leaf, maintaining a consistent, light layer. I continued layering graphite with a softer 2H and sometimes HB, darkening shadow areas and overlaps, giving more depth to each leaf. After setting the piece aside, I took one more look and lightened some areas with my trusty, kneaded eraser. Once I was satisfied with the shading (and at the point where I did not want to start overworking it! 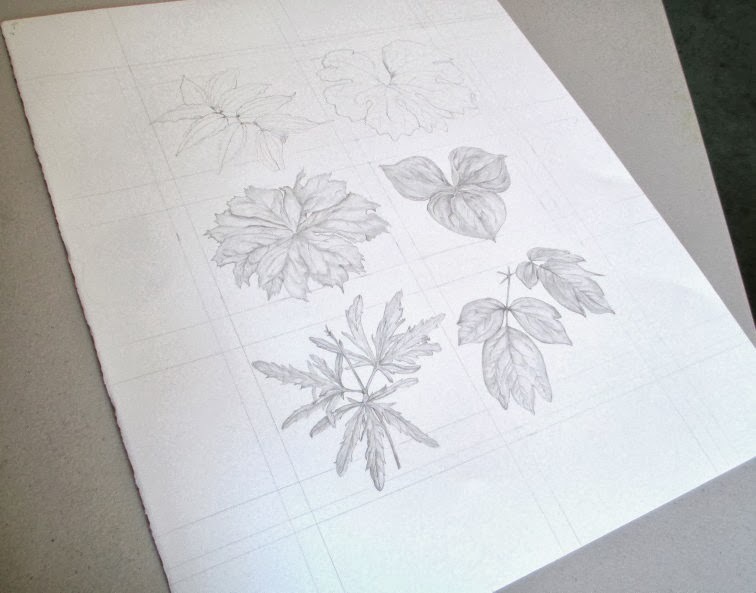 ), I darkened the grid lines, erased any extra guidelines and added labels for each leaf, printing in graphite along the bottom of each row. The final touch, of course, was to have the finished piece framed. The kind and talented staff at Dexter Picture Frame Company really completed the piece, helping me to choose a double mat with a light gray interior that really highlighted the graphite work. 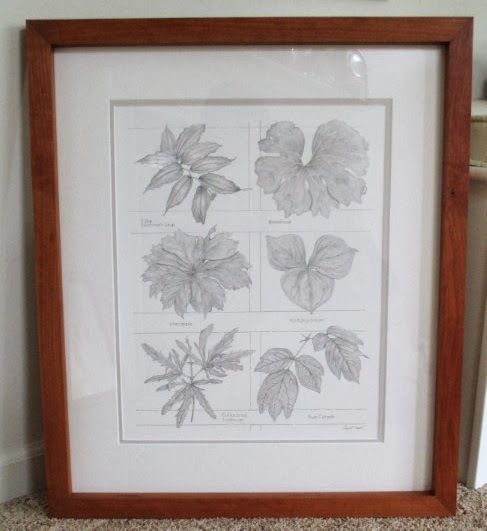 I also chose to use the same, clear cherry wood frame that I used for the Jack in the Pulpit piece. The wood is from Paul Hickman (Urban Ashes) who uses urban salvaged or deconstructed wood from right here in Michigan. I delivered both pieces to Matthaei Botanical Gardens today, along with all of the other 40+ artists in the show. The show opens next Saturday, October 12 and runs through November 10 and will be on display in the Botanical Gardens building at at 1800 North Dixboro Road in Ann Arbor. The exhibit will be available in an online art auction as well, which I will update here when I get the details. All pieces will be for sale, with part of the proceeds going to the artist and part going to Legacy Land Conservancy. After November 10, the exhibit will be stored again until spring when it will be exhibited again at the Sandhill Crane Vineyards in Jackson, MI. Be sure to stop by! Next Shop Small Business This Year! I love that you chose to do the leaves rather than another plant portrait, and what a great job you did on them! Wish I were close enough to see the exhibit. You should be very pleased with the work you have done for this.-Anita. Love the composition and the rendering. Great job.